"Reports of my death have been greatly exagerated"
Like many other armchair watchers of the war in Iraq, I found myself "almost" believing Mohammed saeed al-sahaf aka M..S.S the iraq information minister. Mohammed Saeed al-Sahaf. "Today, the tide has turned, we are destroying them. " of the city. I say to you this talk is not true. This is part of their sick mind." "The infidels are committing suicide by the hundreds on the gates of Baghdad... Be assured, Baghdad is safe, protected. Iraqis are heroes." "As our leader Saddam Hussein said, 'God is grilling their stomachs in hell." "We made them drink poison last night"
"Saddam Hussein's soldiers and his great forces gave the Americans a lesson which will not be forgotten by history. Truly." "God willing, I will provide you with more information. I swear by God, I swear by God, those who are staying in Washington and London have thrown these mercenaries in a crematorium." "There are no Iraqis disguising themselves""we have given them a sour taste"
"Washington has thrown their soldiers on the fire"
"I can assure you that those villains will recognize, will discover in appropriate time in the future how stupid they are and how they are pretending things which have never taken place"
"They will come and we will slap them about the head and then kick them on their backsides when they leave"
About Bush: "the leader of the international criminal gang of bastards." Self-deluded? Cunning? Or just downright comical? Whatever one's view of Iraqi Information Minister, Mohammed Saeed al-Sahaf, one can't deny his style. Since Saddam Hussein went to ground, the clean-shaven, bespectacled Minister has become the public face and voice of the Iraqi regime, setting new standards of anti-American vitriol. "Blood-sucking bastards", ignorant imperialists, losers and fools are among his descriptions of the US and UK leaders. Undaunted by Coalition successes, he is apt to flatly deny what viewers around the world can see unfolding on their TV screens. Holding a press briefing yesterday on the roof of the Information Ministry, he told reporters that Baghdad was safe, and that US troops were "committing suicide" at the gates, despite black smoke billowing behind him, and the sound of fighting echoing around the capital. 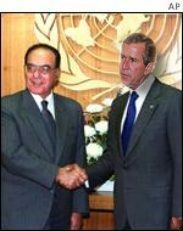 Sahaf (63), who once trained to be an English teacher, was Iraq's foreign minister for almost a decade and ambassador to India, Italy and the United Nations. Considered close to Saddam but not part of the ruling elite, he has been used in the past to deliver some of Iraq's more conciliatory messages, such as an apology late last year to the people of Kuwait for the 1990 invasion of their country. His daily broadcasts from Baghdad - dubbed The al-Sahaf Show - have made him an unlikely media star, and hero to many in the Arab world. However, Faisal Salman, managing editor of the Lebanese newspaper As-Safir, notes viewers "don't exactly pause at what he says as much as they are eager to listen to his funny words". Mohammed saeed al sahaf page 2sahhaf "wild donkeys"
Iraq information minister, where are you ? Iraqi information minister mohammed where are you ? "We made them drink poison last night" "we have given them a sour taste"
"They are most welcome. We will butcher them."